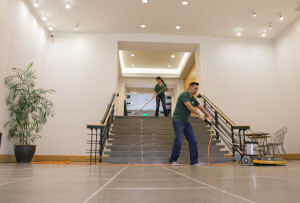 Action Cleaning Service offers general and specialty cleaning services and building maintenance for many different facilities and office buildings. We have the workforce, equipment and expertise to clean any building to the highest standards. Our goal is for our clients’ workplaces to always look their best. We will work with you to customize a plan to maintain your facility and offices so that there is no guesswork about what cleaning services we provide and what you can expect. We will accommodate your work schedule by being available 24 hours a day, seven days a week. We offer our clients a one-on-one walk-through of your business, ensuring that all services you request are granted and nothing is overlooked. Approximate square footage of space needing cleaning. WOW, let me say I didn’t recognize the place. I can’t remember when the floors have looked that great. And the walls, I thought they had been repainted. I have to say WOW once again. Holy Smokes. You guys are AMAZING!!!! Your team is what we’ve been looking for. My hat is off to you ! Thank you for the great cleaning so far!